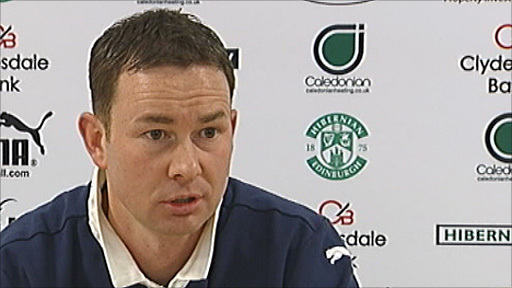 New Hibernian assistant Derek Adams says he turned down the chance to manage Scottish Premier League clubs because they lacked ambition and funds. Adams refused to name any club, but Kilmarnock and St Mirren were both looking for a new boss in the summer. "I had the chance to go, but the clubs I had the opportunity to go to were not the right clubs," he told BBC Scotland. "They didn't have the finance to go forward and they didn't want to be played the way I wanted to go forward." Adams finally accepted the offer to assist new Hibs manager Colin Calderwood and left Ross County, where he had been manager for three years and led the Dingwall club to Division One and last season's Scottish Cup final. But he stresses that he still wants to manage in his own right in the SPL one day and does not see the step down to assistant manager as a backward step. "I always want to be a manager in the SPL and I want to be a manager in the SPL in my own right and that will happen in time," he said. Adams says that he did not apply for the manager's job at Easter Road when John Hughes was sacked in October but was delighted when he was asked about assisting Calderwood. "I got the phone call from the manager and I then spoke with the chairman and the chief executive," he recalled. "And I was delighted when they gave me the opportunity to join here. The lure was too much for me to turn down."